Bass at times move quickly and hold on a variety of cover, so by being able to change up the size of your tungsten weight and the soft plastic bait your rig on the hook, you can alter the lure profile and presentation to the bass below. It is important when selecting the weight of your tungsten to use one that is heavy enough to get through the cover you are fishing, down to the needed depth, or heavy enough to battle the current if present. But you’ll still want to use the lightest weight as possible, as the smaller size weight won’t inhibit the action of your soft plastic in the weight. This is why, using non-traditional size weights, like 7/16 or 5/8 can be key, as they are just smaller than the size up sizes in ½ or ¾ ounce. Some of the soft plastics I’ll rig up include the Zoom Z Craw, Super Speed Craw or a Super Hog, all of which is dependent on the amount of action the bass want on any given day. 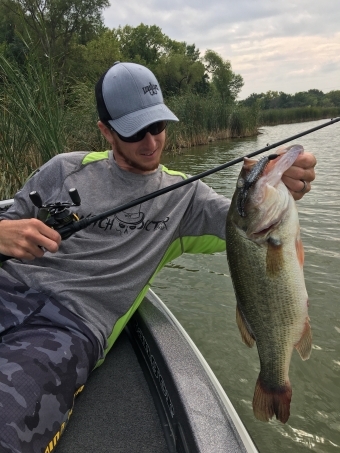 Don’t just stick to rigging up craw or creature baits, pitching soft plastic stickbaits on a Texas-rig is a great way to target pressured bass in heavy cover. From a 5” Senko to a Zoom Magnum Trick Worm, your presentation can still have some bulk to it, but yet have a finesse profile as these baits don’t have any appendages that move in the water. Using a strong, sharp hook is key when Texas-rigging, as is a hook that keeps your bait in place as you bring the rig through heavy cover. I like to use the Eagle Claw Lazer TroKar TK133 Pro V Ben Flippin’ Hook, as I feel it delivers increased hook up’s and the TroKar Barb near the hook eye secures my plastic. My choice for gear when I’m just fishing whatever fish holding cover is in front of me is a Witch Doctor Tackle Voodoo II 7’2” Heavy Rod, as I can make short flips to isolated heavy cover, put my Texas-rig underneath boat docks, or make a longer pitch to an offshore weedline. I’ll use a high speed Wright & McGill Victory II Reel as I want to be able to pick up the slack in my line when a bass picks up the bait and runs off. Spooling up with 15 to 20 lb Fluorocarbon line is my choice, as Fluorocarbon is extremely abrasion resistant, has little to no stretch, all while being very sensitive. If I’m targeting more abrasive shallow cover like wood, rocks or docks, I’ll use 17 lb Seaguar Abraz X or 20 lb TATSU, where as if I’m making casts to offshore emergent vegetation I’ll go with 15 or 17 lb Seaguar Inviz X. When you are on the water this year, make sure you have that rod rigged with Texas-rigged soft plastic bait on the deck of your boat as many times it will get bit regardless of the fish holding cover you are fishing. To follow Glenn throughout the season or for more helpful information check out glennwalkerfishing.com or on Facebook at facebook.com/glennwalkerfishing.